The old adage, “f/8 and be there,” is dead. Long live shooting purely on f/1.2, because if you can do it, you might as well do it right. What’s that you say? A lens isn’t at its sharpest when it’s wide open? Whatever. 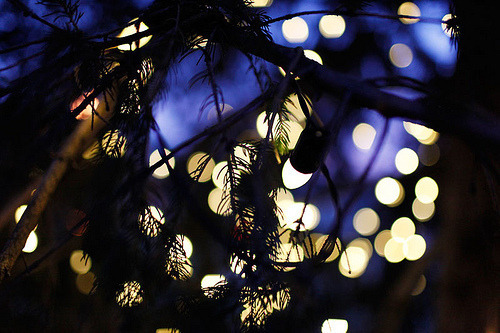 A picture doesn’t have to be good if it has bokeh. I think my ideal picture would be President Obama playing with puppies and small multicultural children against a field of rainbow bokeh. The word beautiful doesn’t even cut it. I've been watching Babylon 5 lately. It's not a perfect show, but it has one big advantage: it's consistent and believable. Contrast this with Doctor Who. Doctor Who is fun to watch, but if you think about it for more than two seconds you notice it's full of plot holes and contradictions. Things that cause time travel paradoxes that threaten to destroy the universe one episode go without a hitch the next. And the TARDIS, the sonic screwdriver, and the Doctor's biology gain completely different powers no one's ever alluded to depending on the situation. The aliens are hysterically unlikely, often without motives or believable science, the characters will do any old insane thing when it makes the plot slightly more interesting, and everything has either a self-destruct button or an easily findable secret weakness that it takes no efforts to defend against. But I guess I'm not complaining. If the show was believable, the Doctor would have gotten killed the first time he decided to take on a massive superadvanced alien invasion force by walking right up to them openly with no weapons and no plan. And then they would have had to cancel the show, and then I would lose my chance to look at the pretty actress who plays Amy Pond.